Originally developed as a diet dish by Swiss physician M. Bircher-Benner (1867-1939), reinterpreted by us. With flaked wholegrain oats and Verival wheat from our contract growers, blended with 3-fruit flakes, sultanas, figs, diced apple, apple flakes and hazelnuts. Inimitable and purely organic. Good morning! Oat flakes*, wheat flakes*, 3-fruit flakes* (wholegrain wheat flour*, date juice concentrate*, apple juice concentrate*, banana purée*), sultanas* 6% (sultanas* 99,5%, sunflower oil*), chopped figs* (figs* 97%, rice flour*), apple cubes*, apple flakes* (apple purée*, rice flour*, apple juice concentrate*), roasted hazelnuts* 3%, chopped and roasted hazelnuts* 2,5%. > May contain traces of sesame seeds, soy, lupines and other nuts. 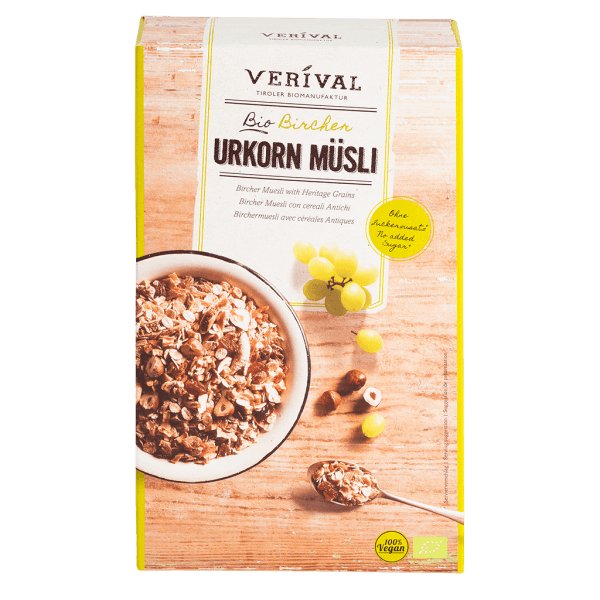 > Our Bircher Muesli is the ideal basis for creative muesli ideas. > **Contains naturally occurring sugars. Can be eaten cold or even warm! Cold: Best enjoyed with milk, natural yoghurt or plant based alternatives. Warm: Bring milk to boil, stir in your Müsli and let it stand for a few minutes to cool, before eating.